Urban greening is taking hold around the world, infusing cities with lush pockets of greenery. From sky gardens to vertical urban farms, designers are becoming increasingly creative as they seek to restore the balance of city living. Globally, we are seeing a number of exciting responses to the challenge of integrating nature into the built environment. The innovative green spaces appearing in some of the world’s largest cities show us what’s possible for creating a future where urban hubs are not only more sustainable, but also designed to improve the wellbeing of residents. Here are five urban greening trends emerging around the world. Seoul Skygarden – image via designboom, photography by Ossip van Duivenbode. New York’s High Line may be the most famous example of a sky garden, but around the world there are a number of instances where urban spaces have been transformed into green public spaces. In Osaka, the Namba Parks shopping complex has an eight-level rooftop garden complete with waterfalls, ponds and a vegetable garden. And most recently, Seoul has opened its own Skygarden on an abandoned overpass, introducing 24,000 new plants to the cityscape. 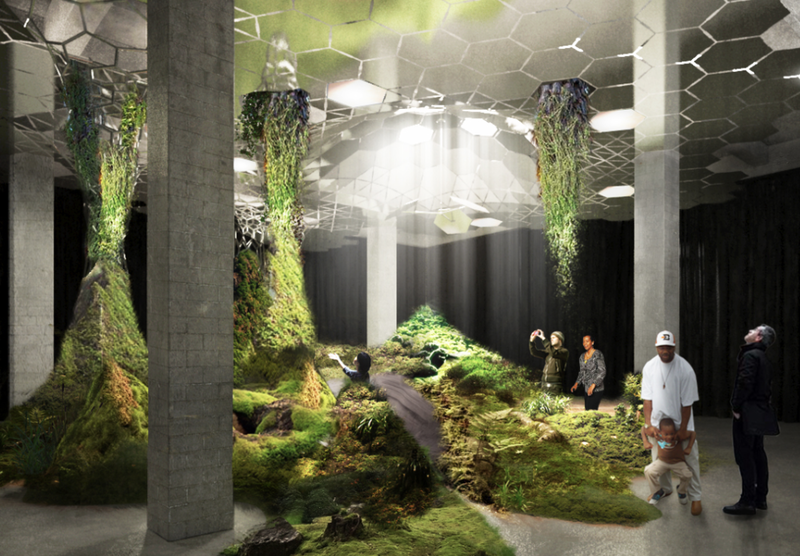 From sky gardens to those hidden underground, New York is destined to have the world’s first underground park when the Lowline opens in 2020. The underground garden looks at how we can use technology to make cities more liveable and will use a specially designed remote skylight to allow plants to grow underground. Similar to the High Line project, it will rejuvenate an unused space – this time, it’s a historic trolley terminal. If you are planning to visit New York, you can get a taste of what’s in store at the Lowline Lab, which is set up in an old warehouse. In countries like China, the availability of productive agricultural land is decreasing, leaving only way to go – up. The Sunqiao Shanghai precinct will be a 250-acre agricultural district with hydroponic vertical farms for growing produce. Small-scale agriculture is China’s primary farming method and this new development explores how this model can be replicated in an urban context. The precinct will also include walking trails, public plazas, a science museum and a digital amphitheatre. While biophilic design isn’t a new idea, it’s now becoming more ingrained in the way architects are designing homes. Houses wrapped around internal courtyards – like this one in Singapore – are a primary example of the ways that homes are being integrated with nature. These types of solutions are a smart response to the challenge of urban density, where large backyards are not always possible. At this family home, Chang Architects have integrated a rooftop garden and an impressive internal courtyard into its design. Where China is embracing vertical gardening for food production, Mexico is using it to fight pollution. 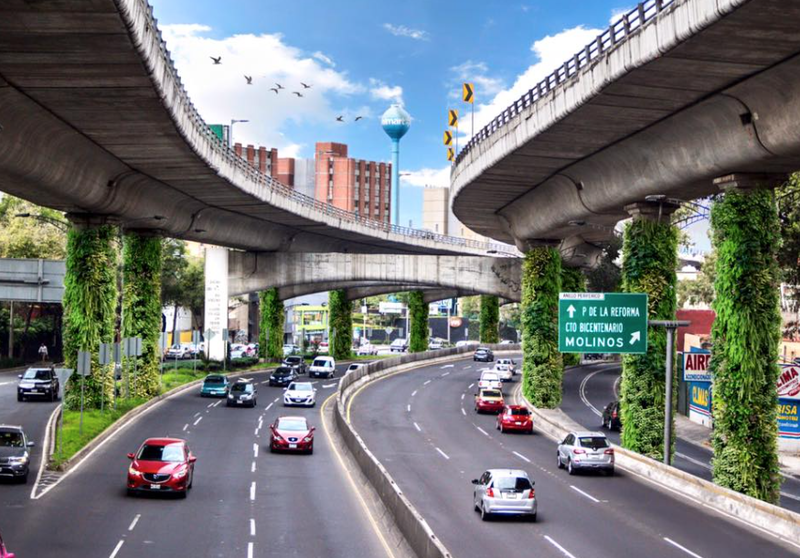 In Mexico City, large vertical gardens have been installed on hundreds of motorway pillars to help clean the air. The gardens have also been found to reduce the stress levels of motorists and absorb traffic noise, and they’re also beautifying the city. They are part of a citizen-led intiative called Via Verde Project, which was established to address the city’s rising pollution levels. Get inspired to green your own urban space with our free ebook, Small Spaces, Big Ideas.